A successful business starts with confronting the facts. But you can’t confront the facts without knowing them! We understand that many business owners spend too much time in the business and not enough time looking at it. 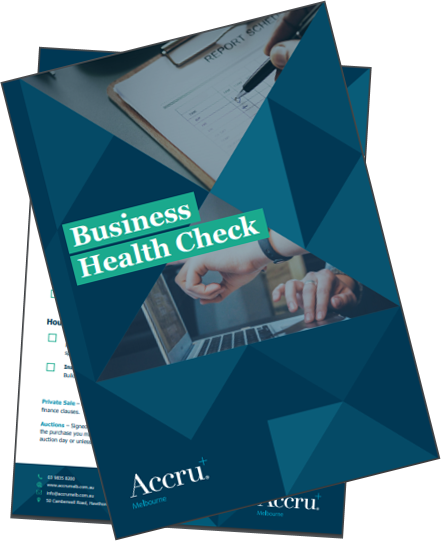 A Business Health Check can provide you with an invaluable insight that will ensure you are ideally placed to plan the future of your business. In this survey we take a deep dive into key areas of your business and ask questions that will help you identify gaps and opportunities to realise your full financial potential. Reputation - We are an award winning financial services firm with over 50 years’ experience, 70 staff and a passion for excellence. We are dedicated to ensuring our professional and proactive advice stands out from the rest. Personalised Service - We offer trusted advice, tailored especially for you. We will work with your best interests in mind, not ourselves or others. With our extensive experience and knowledge, we will find the best solutions for you. Full Service Offering - Our highly personalised, holistic approach offers a range of expert services in relation to business and finance. Services include; Audit, Business Advisory, Insurance, Lending, Superannuation, Tax and Wealth Management. Partner Access & Location - Having access to the experience and knowledge of the firm’s Partners is something that we are proud of. With all our staff located in our Hawthorn East office, this ensures that the financial help and support you need is all in one place. Seamless Experience - We understand the importance of saving time and streamlining your experience. Whether you’re buying a house, changing your superannuation or getting business advice; we make sure that the help and support you require is available in the same interaction avoiding the need for multiple visits. No Jargon - The complex and technical information in the world of business and finance can be confusing. Our friendly, professional and experienced staff, remove all the technical jargon and make sure that we understand exactly what you want and communicate our advice in a way that you understand. "Accru took the time to learn about our current business structure, and understand our business and what we wished to achieve from a business and personal perspective." A Business Health Check can provide you with invaluable insight that will ensure you are ideally placed to plan the future of your business. In this survey we take a deep dive into key areas of your business and ask questions that will help you identify gaps and opportunities to help you realise your full financial potential.